A WordPress framework (or theme framework) is a theme used as the foundation for a more customized theme. Unlike the wooden framework for a house, however, a WordPress framework can sometimes be used as theme without further work, and not all themes are built using frameworks. 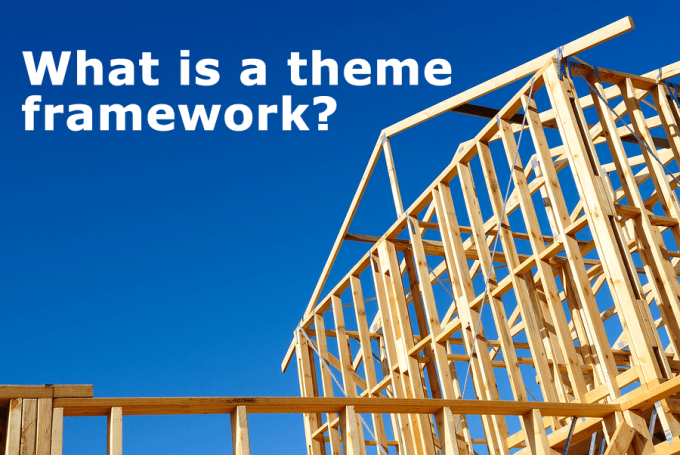 Technically the term “theme framework” is used in two ways. First, as a parent theme supporting a child theme. In this case, the parent theme is installed and used as is. Second, as starter code to develop a new theme. Unless you a theme developer, your interest in a theme framework is as a parent to a child theme. Examples of popular theme frameworks include Genesis, Thesis, Builder, and Themify. The benefits of using a theme framework are many. Here are five. 1) Speed of Custom Development Using a theme framework means that your developer does not have to reinvent the wheel coding generic features that are already included in a framework. This means faster website development and less cost to you! 2) Quality of Code Premium theme frameworks (such as those listed above) are created by professionals who understand WordPress coding standards, and how to optimize WordPress code for speed, security, and maintainability. 3) Support Premium theme frameworks come with support and documentation. Support packages do, however, vary from developer to developer, so be sure to understand exactly what kind of support (and for how long) is included with your license. 4) Updates A framework that is still supported (and has not reached its end of life) will have periodic maintenance upgrades released by the developers. These will include patching of security holes, bug fixes, and possibly new features. Because of the parent/child structure of a theme framework, you can easily upgrade your parent theme without losing any of your customization in the child theme. Keeping up to date on theme updates improves the security of your website. 2) Size of community Because popular theme frameworks have a huge community of users and developers, you can often find answers to your questions via Google or by posting your question in a user forum (either run by the theme developers or by other third parties.) Another benefit of a large and lively user community is the ease of finding talent to hire. Although I listed this reason last, it is one that is very important to me. I love being able to Google “how do I (insert question here) WordPress Genesis” and finding answers. What are the cons of using a theme framework? Well, they usually cost money, and the may include features that you don’t need (which might slow down your site.) All-in-all, I think using a theme framework is an excellent investment. When I first looked at WordPress in 2007, I wasn’t a big fan until I met my first framework in 2009: Thesis. Fast forward, I am now using Genesis Framework on all new sites, and working on moving my older sites to Genesis as well.